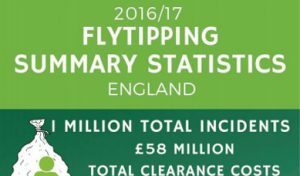 For the year 2016/17 local authorities in England have reported that fly-tipping has increased 7% from the previous year. That’s around a million incidents. A third of which is reported to be commercial non domestic waste. A report from the Department for Environment & Rural Affairs explains that the most common size category for fly-tipping incidents is equivalent to a ‘small van load’ which totalled 33% of total incident. The cost to the taxpayer is in the region of £58 million to clean up the Fly-Tipping incidents in England. All business is legally responsible for their waste, from the date the waste is produced, recycled or disposed of, and all storage and handling stages. Business has a duty of care to ensure that all waste is disposed of correctly. · keep to the restrictions if waste is moved between countries. Commercial organisations and trades can face unlimited fine if waste ends up fly-tipped and it cannot prove it took reasonable steps to prevent it. Failure to produce acceptable documentation or Waste Information Notes when asked by the Council or the Environment Agency is an offence, for which Fixed Penalty Fines of £300 can be issued. At TopSkip’s we reduce the risk and ensure that all our suppliers operate accordingly. All waste is disposed of in a legal and licenced manner. Only registered waste carriers will carry your business waste. This ensures that your trade / commercial waste is disposed of correctly, and does not end up fly-tipped.